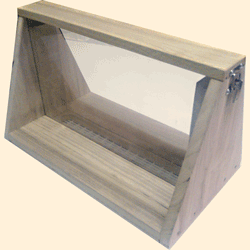 Nucleus Observation Hive Top, Standard Deep - top only for those who already have one of our 6 Frame or 5 Frame 1/2 Bee Hives, hive not included. An extra pair of toggle catches and screws to attach the top to a hive. These are designed for the temporary observation and display of honey bees. When not in use the nucleus hive is managed as usual in the apiary. When observation or display is required, place the queen and the frame she is on into the observation top and replace this frame with the frame feeder. Use a weak e.g. 25% sugar syrup so the bees can dilute their honey stores. The whole unit can be carried and transported. A small colony is not harmed by temporary confinement as long as they have syrup in the feeder so limit use to a day or two. This is a good way to make use of a retired queen bee.